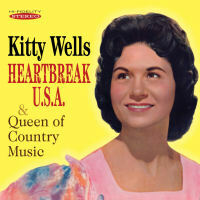 Kitty Wells was the unchallenged "Queen of Country Music" who reigned throughout the 1950s and 1960s. On this CD twofer of two complete albums, HEARTBREAK U.S.A. and QUEEN OF COUNTRY MUSIC, plus bonus tracks, Kitty sings a collection of heartbreak songs all dealing with the heart including Kitty's third #1 smash hit HEARTBREAK U.S.A., MOODY RIVER and AM I THAT EASY TO FORGET. All tracks have been re-mastered in glorious stereo.